It’s no secret that California is an agricultural juggernaut. From pinot wine grapes to a literal cornucopia of other fruits and vegetables, The Golden State is no stranger to the honeybees’ bounty of crops … at least not until recently. But that’s a beef for another day. This one is about pesticides’ effect on pregnant women, not bees (it turns out they’re harmful to pests and everything else). In 2010, California’s plethora of crops grossed $38 billion in revenue. So what better place to do a massive multisite pesticide study? From the Sacramento Valley to the Mexican border, there is fertile land with an abundance of crops “requiring” about 200 millions of active pesticides every year. Researchers with the UC Davis MIND Institute set out to examine the correlation between pregnant women being exposed to specific classes of pesticides like organophosphates, pyrethroids and carbamates and subsequent diagnoses of autism and other developmental delays in their children. Unsurprisingly, there was quite a correlation. 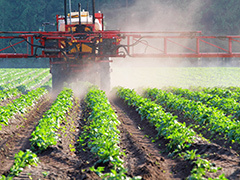 The risk of having a child with autism spectrum disorder was two-thirds higher for women living near fields or farms where pesticides were used regularly and even worse for exposures occurring during the second and third trimesters of pregnancy. "This study validates the results of earlier research that has reported associations between having a child with autism and prenatal exposure to agricultural chemicals in California," said lead study author Janie F. Shelton, a UC Davis graduate student who now consults with the United Nations. Posted on June 27th under Pollution Reduction.